Tree swings provide an experience that feels natural and brings back good memories of the past. Past generations and current generations have experienced or would love to experience the feeling for themselves. They are good for quality time outdoors, more so for your kids. They can keep their PlayStation back in storage as they enjoy the swinging motions. There is no fault in adults joining in on the fun for a nostalgic and therapeutic moment. In the past, the swing was made of basic materials of just a rope and a wooden seat. 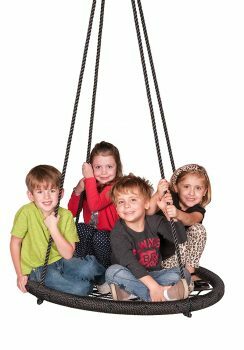 Nowadays the swings come in different designs, to ensure maximum comfortability and varied experiences for the user. You will find a couple of gems on the list we have created. 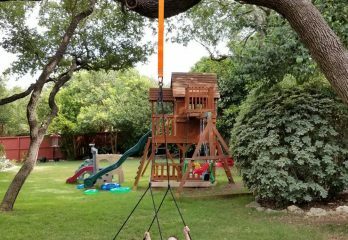 What to consider when buying a tree swing? Why you need a tree swing? We kick off our review with the squirrel products tree swing. The main reason for it being here is how portable it is. 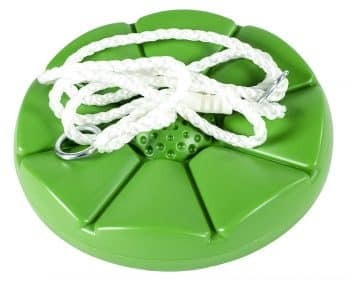 A rope is of high quality braided nylon rope, and strong lightweight polyethylene plastic seat combines to have a weight bearing capacity of 200 pounds. This makes it perfect for your whole family during camping trips. Even adults can have some fun on it. To enhance its portability aspect, a metal ring makes it fast and easy to set it up. Within no time, you can hook it up to a tree on your road trip. Squirrel products have not left out people that are looking for a permanent fixture. They have included a heavy-duty swing hanger for the said intention. It is Available in four different colors. It is Fast and easy to set up. Straight of the box, this tree swing is ready to work. With the easy to follow instructions included, setting it up only takes a few minutes. It is made of thick rope, which is soft and does not irritate your hands. This thickness also guarantees it will last for many years. Play Platoon also stands by their product, giving you the user a 1-year warranty. You can boost this cover to two years, by simply registering your purchase to their website. We doubt you will need the warranty anyway. Perhaps the best feature we like about this swing is its design. Rather than only being restricted to back and forth motions, this swing also can rotate 360 degrees. This gives the user a new kind of feel. With a weight bearing capacity of 400 Lbs. even two adults can have a go at it. There is something about the simple wood and rope mechanism of past swings. Perhaps it is in the simplicity that makes this tree swing one of the best in the modern world. 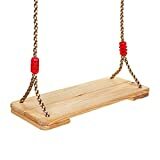 It is made of simple wood and rope design that gives the past users nostalgia. The good old days are brought to view rather than plastics that are mostly used in today’s seats. It also acts as a fashion accessory to your backyard. The seat itself is cut from the finest hardwood. 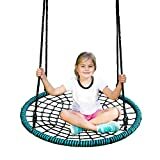 This gives it the ability to bear a weight of up to 300 pounds comfortably, ensuring both adults and kids can join in on the fun. The hardwood also means it is weather resistant. Therefore, you do not have to worry about it getting damaged. No matter if, it is summer or winter. It will be waiting and ready. If you anticipate having more people join in on the fun, the company offers 5% discount for an extra purchase or 10% for more than 3 tree swings. Fun Tree Swing offers a 30-day money back guarantee. It works great on all weather conditions. 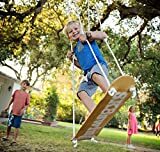 Your kids or their guests do not have to wait a turn for them to enjoy swinging in the backyard. That is why SUMMERDREAM’s tree swing makes it to this list. The two main reasons are that it is cheap, secondly, you can choose from six different colors. The rousing colors are yellow, orange, lime, green, pink, blue, and red. This encourages your kids to play and have fun when you buy different colors. In the package, a 7-foot long strong rope is included. This gives you the ability to adjust this swing to a high degree. It is not just cheap for the sake of it. The quality is so good. The company, claims to give a full refund, no questions asked, in the unlikely case you are not satisfied with their product. SUMMERSDREAM offers a money back guarantee. 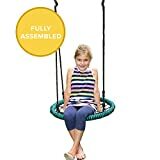 The price of this tree swing is unbelievable when you consider all that you get in the purchase. 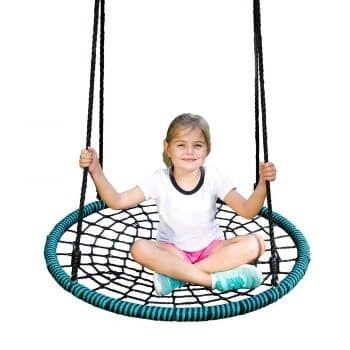 A combination of a steel frame, safety padding, and a high-quality rope ensures your kid has the ultimate fun, without worrying about his or her safety. 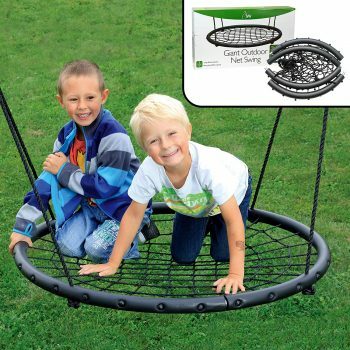 They can also bring a friend along since it is wide enough and can hold up to 220 Lbs comfortably. On top of the high-quality materials used, the design is on a superior level. Not only is the frame light in weight, but it also folds to a compact size. This makes it great to move around with you to distant places. Your kid will have a place to play together with their friends, readily available. It comes with a hanging ring to quickly hook it up. Has a design that makes it easily adjustable to find the right elevation. There is a niche in the tree swing industry that manufacturers have left out for many years. The Little Tikes company, mind you an American based company, took it upon themselves to ensure even your small child will have some fun. Its tree swing has a T-bar strap that holds your child who is 9 months to 4 years in place. Therefore, when you or your other older children are having a blast on another swing, the young one is not left out. Do not fret about their safety through the adjustable T-bar strap mentioned earlier. It is very strong, and in our independent test, it has not failed us once. The straps are adjustable according to the height and weight of your child. These straps go over the kid’s shoulder and snap into the T plastic. It has enhanced security features for smaller kids. Its straps are padded to ensure your kid’s comfortability. Enjoy quality time with your kids in the playground on this swing that will outlast most in the market. What we like most about it is its chain design in the cord. The reason why most manufacturers shy away from using chains is how they have this penchant to pinch your hands while you are swinging. Sometimes the injuries can be so terrifying, leaving the user of horrid memories on a swing. 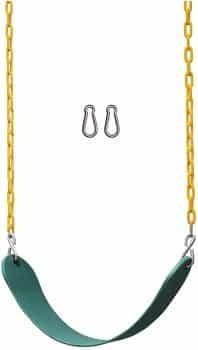 However, fear no more, since Jungle Gym Kingdom’s swing chain has a plastic coating that ensures your hands are not pinched at all. You may be asking yourself why buy this chain design while there are normal cord cables. Just remember steel is durable than plastic when set in optimum conditions. It comes with specially designed swing hangers. It is comfortable for adults to use. Sk8Swing rethought what a tree swing should look like. Rather than have the usual back and forth motion, you can rock with this swing like a skateboard. It is surprisingly strong enough to be used by adults. You can rock your body as if you are skateboarding. This rocking motion exercises your core muscles, conversantly making you stronger for longer. The unique design makes it an eye-catching device for your backyard, which kids and adults will enjoy to look at. This device will make your kid turn off their play stations and play outside. Do not be surprised to find the neighborhoods kids flocked in your backyard from time to time. It is ready to use straight out of the box. Sk8Swing provide excellent customer service. It has the ability to swing or spin. We finish our list with the Play Platoon tree swing. It is hard to fault it for anything. You can swing on it or swivel on it if you like. It can even carry two adults thanks to its 600 lb. weight bearing capacity. On top of this, the manufacturers have included extra accessories in the package, so if you lose a strap, metal or a carabineer, you will be well covered. If this is not possible, Play Platoon respond fast to your replacement needs. This ensures you will not have an off day when a cable is lost or a screw disappears. The setup is easy. You do not need any tools, and in five minutes, your kids can get off the play station, and have some fun in the outdoors. It may look pricey, however with this swing. It has features of say 3 swings combined into one product. Making it worth every penny when you consider the said swings cost probably two thirds the price. It comes with easy to follow set up instructions. It comes with a 1-year warranty or 2 years when you register on the Squirrel Products website. 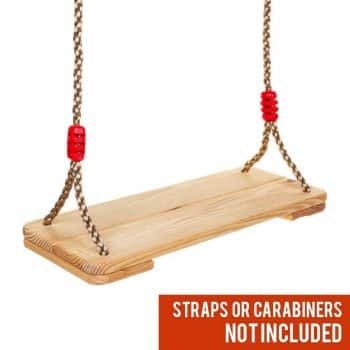 Size: tree swings come with different load bearing capacities. In this review, we have included some that can accommodate one person and up to two adults comfortably with variation in between. So consider the number of people you look forward to using the swing and get the right one for your needs. Materials used: check to see that the materials used to make your swing are comfortable to the end user. Materials used vary from steel, polyester, wood, and plastic. A little bit of either material is on different parts. Price: Capacity and materials used affect the prices on tree swings. This means if you have a large swing, definitely it is going to be more expensive than a smaller swing. We are aware of poor quality swings that have flooded the market. In this list, we have ensured you get value for your money. For fun: the experience on a tree swing is one of a kind that reverberates throughout all ages. There is a need to relive such experiences. For relaxation: it is fun to spend time on swings. Albeit addictive, in some cases. Your muscles get a good bit of stretch and your mind feels relaxed when on a tree swing. The market has many options when it comes to tree swings. This is because of the increased demand for the classical user experience. Nevertheless, we have taken the time to look at the best swings from first-hand experiences. We have not neglected your safety as a first, thus the risks are kept to a bare minimum of the user causing harm to themselves. Grab one of these swings in this review, and you will not regret your purchase.